Bender UK has played a key role in the provision of critical power IPS and UPS supplies and the touch screen theatre panels controlling vital services within the 16 operating theatres at the Alder Hey in the Park children’s hospital in Liverpool. The new hospital provides was designed in consultation with patients and their families, the Prince's Foundation and National Arts for Health. It is the UK's first integrated children’s health park providing 270 beds and can care for up to 275,000 children each year. The vastly improved clinical areas include 12 in-patient and four day case operating theatres, 48 critical care beds, a specialist burns unit and a new Accident and Emergency department, along with education and research facilities. 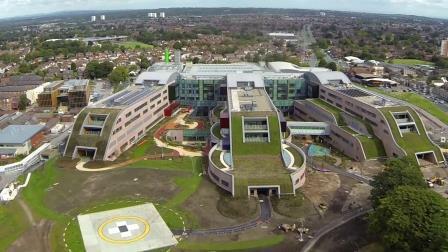 The Acorn consortium, comprising John Laing, Laing O’Rourke and Interserve built the new £237 million hospital on behalf of Alder Hey Children’s NHS Foundation Trust. The two year build programme established the hospital as the fastest ever UK healthcare sector construction project. Bender UK’s Operations Manager Gareth Brunton explained that the demanding timeline for the project meant it was crucial that his team worked very closely with the project team and particularly Crown House Technologies which managed building services design. Bender project managed the package of works incorporating the supply of isolated power supply (IPS) systems, uninterruptible power supply (UPS) systems combined with the installation, testing and commissioning of cabling through to blue socket outlets in critical care areas. Within the hospital’s 16 operating theatres Bender was responsible for the supply and installation of hygienic touch screen panels to control services and surgical lighting. The majority of the control panels incorporated twin 21 inch PACS viewing screens for digital x-rays and scans, and all of the panels were equipped for iPod interconnectivity. Bender is a leader in theatre control panel contemporary membrane technology. The wipe clean membrane design delivers maximum sterility with a unique anti-microbial silver nitrate coating. It enables staff to exercise safe control of the theatre environment through an ergonomic single point of reference, even when wearing surgical gloves. It was important for the building services designers that suppliers were able to deliver to a very tight schedule and Bender UK’s previous experience, along with the outstanding quality and value of its products, made the company a natural choice for the project. Bender provided technical assistance and information to ensure that the project team was aligned with the project’s critical path. As time was of paramount importance, Bender also carried out the electrical installation, commissioning and validation works associated with the critical areas.